how to verify a supplier is registered to legally collect GST/HST. In the introduction to this guide, I explained how GST/HST works in Canada. Then in part one of the guide, I discussed when and how to register. Now that your registration with CRA is complete, we need to chat about of how to file your GST/HST return on Form GST34-2 and other issues you may run into. CRA assigns you a Business Identification Number (BIN) that you will use when dealing with CRA once your registration application is accepted. You must then begin charging GST/HST on taxable goods and services you provide to your customers based on their location, not yours. It is a good practice to quote your GST/HST number on all your invoices. If you are using accounting software, there is normally a spot to enter your GST/HST number so that it will print automatically on your invoices. In QuickBooks®, it is found under the "Company" drop down menu. ... when you file your report on form GST34-2 to CRA, you recover your ITCs by offsetting them against the GST/HST collected. The formula is shown below. A negative number on line 109 means you will be receiving a refund. 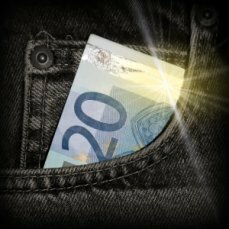 If your ITCs exceed your GST/HST collected, CRA sends you a refund ... Whoo Hoo! ... and if you signed up for direct deposit during GST HST registration, the refund goes right into your business account, usually within 2 weeks of filing online. It's great. No running to the bank. So take note, this means you are required to maintain adequate books and records in order to report and pay your GST/HST. GST/HST Memorandum 15-1 General Requirements for Books and Records has information on how these books should be kept. GST/HST Memorandum 15-2 Computerized Records also has information on books and records. If you have registered for My Business Account with CRA, you will have online access to your account information. My Business Account is a real time saver ... no more waiting on the phone to speak with an agent ... just look it up yourself 24/7. I love it! As of May 19, 2009 CRA Agents must identify themselves by providing you with their first name. ... BUT I learned, while taking my H&R Block tax course, that CRA is not bound by the information the agents provide ... however, it may assist in having penalties and interest waived in the event of a dispute. Take a moment now and make sure you are familiar with GST/HST tax rates on out of province sales and the rules for charging GST/HST on internet sales. Once you've done that, come on back so we can chat about some reporting options you have. After the GST HST registration process is completed (okay you've come this far ... don't give up now! ... just take a deep breathe and let it out slooooowly ... feel better?) and you have your BIN, you need to consider which reporting method you want to use. Following are 2 other choices to consider instead of using the regular method I explained above. ... further complicated by the provincial sales tax reporting. In my opinion, from a bookkeeping perspective, each of these "simplified" methods are harder to apply than using the regular method of tracking your ITCs ... so think through your choice. 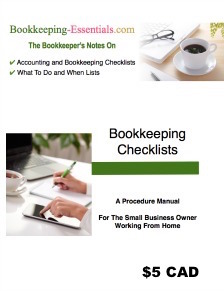 The Quick Method of bookkeeping can be used if you have less than $200,000 in sales (again there are some exceptions) and have filed an election on Form GST74 Election and Revocation of an Election to use the Quick Method of Accounting. This method is great for you people who don't keep an up-to-date set of books because you don't have to track your ITCs separately ... well not really ... you have to have a method to pull out or track your exempt sales, eligible sales by tax rate paid ... and personal use supplies. ... Instead you multiply the amount of your sales (including GST/HST) by a rate (which is less than the rate of tax you charge - between 1.8% and 3.6% ). ITCs on capital purchases are assessed separately. where your services are provided. See The Quick Method Rates page for more information. 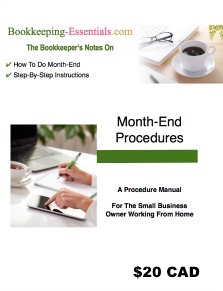 If you select the Quick Method of bookkeeping, you must use it for at least a year. The Simplified Method can be used if you have less than $500,000 in sales. Like the Quick Method, you don't have to track ITCs separately ... well again, not really .... you do have to track your HST and GST taxable purchases separately by tax rate paid. When reporting GST, the purchases are multiplied by (the current GST rate / (100 + the current GST rate)), which means 5/105, to isolate the GST ITCs. When reporting HST, the purchases are multiplied by (the current HST rate / (100 + the current HST rate)), which means 13/113, to isolate the HST ITCs. The amount calculated is then subtracted from GST HST collected. The difference is remitted to CRA or refunded by CRA. The revised Guide RC4022 states, "If you make purchases in both participating and non-participating provinces, you have to separate your taxable purchases based on the rate of GST/HST you paid." There are other constraints pertaining to personal use and how to report if you offer both taxable and exempt supplies. Given this constraint, I really don't understand why anyone would choose this method and/or how it saves any time. You have now completed your GST HST registration, filed your GST/HST return and discover ... ah heck! ... that you missed reporting some input tax credits for that period. Is there any way you claim these missed ITCs? Yes. Unlike your income tax return where you have to file a T1 Adjustment to correct any errors or omissions ... with GST/HST, you just claim them on your next return. As a small business, you have up to fours years from the date your return was due to claim an ITC. Every time I file a GST/HST return, I close the books up to the end of the reporting period (and make a back up copy ... just in case ... clearly marking it) so I can't post any more transactions to that period. When I get straggler receipts (I mean straggler as this should not be a common practice), I date them for the first date of the currrent period. In the reference or number spot, I type in the actual date of the receipt so I can trace it back to prior period bank statements or credit card statements. I do this because I don't want to have to reproduce reports and ledgers pertaining to past periods for immaterial amounts ... the information has already been given to the client and they are not likely to make a different decision as a result of these few entries. The ITC will now be claimed when I file the next GST/HST return. As a safeguard, print out (or make a pdf copy of) the detailed GST/HST report and attach it to your copy of the back of the GST HST return. If you are ever audited, you will know exactly which credits were claimed for each period ... no reconciling ... or scrambling to find the information for the auditor. This is important because you will have processed future periods by the time you are audited ... and might have booked some addition entries / adjustments to the period in question after the return was filed with CRA. This practice is a departure from the matching principle but any amounts are immaterial to make it an acceptable practice. If you find you are continually having to submit ITCs for prior periods, then you need to make some changes in your bookkeeping procedures ... and it's a red flag if the dollar value of those missed receipts are material. ... but once you file an official report with the government, whether it's a GST HST return or an income tax return, close your books and back them up. Remember, you can also book an accrual to a period ... just be sure to reverse it in the next period when you book your "actuals". It is your responsibility to ensure that any of your suppliers charging you GST/HST are legally registered with CRA to do so. To assist you in determining this, CRA has a GST HST Registry where you can check the supplier out. If you are ever concerned about a particular vendor being a GST/HST registrant, use the registry to set your mind at ease or confirm your suspicions. You are probably wondering "Why do I care?" Well, if you submit ITCs from a vendor who was not authorized to collect GST/HST in the first place ... during an audit, these ITCs will be rejected and you will be expected to pay back the unauthorized ITCs. You might even want to consider implementing this simple internal control procedure. This concludes my chat on GST HST registration. Here are the other chats within this Guide that you may want to review.